This is the 2007 winner of Long Barn Books First Novel Award. From the back cover of A Good Thief’s Guide to Amsterdam: Charlie Howard writes caper novels about a career thief. He also happens to be one. It’s set in Amsterdam, conveying its atmosphere, canals and buildings well for some one like me, who has never been there. 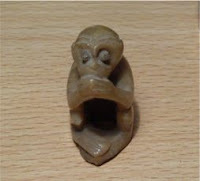 He is asked by an American to steal two little monkey figurines to make up the set, ‘See no evil, hear no evil, speak no evil‘. They don’t appear to have any value and he has to steal them from two different people on the same night. Then the American is found murdered and at first Charlie is suspected of being the murderer. From that point on the book moves at a fast pace through all the ins and outs of the mystery – who did murder the American, why, and what is the significance of the monkeys? At the same time he has a problem with a book he is writing and spends time on the phone discussing the difficulties of sorting out the plot with Victoria, his agent in London. It kept me guessing and amused. The only problem I had reading it was that I raced through it to find out what happens. The three monkeys have always interested me, ever since I was given a small ‘speak no evil’ monkey. It is valuable to me as it was given to me by my favourite aunty. I don’t know where it came from or why there is only one. I always wondered where the other two were. Maybe there is some mystery surrounding this set as well. There are more Charlie Howard mysteries to come. 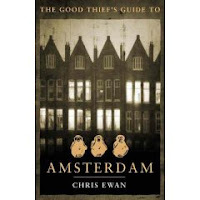 At the end of the book he leaves Amsterdam for Paris and A Good Thief’s Guide to Paris will be the next book in a series of Charlie Howard mysteries, so I’m looking forward to reading more from Chris Ewan. This book sounds really good. That is really weird that you have one monkey just as in the story. That may have freaked me out depending upon how the story ends. Actually I think I enjoyed it more because of my little monkey – it brought back good memories of my aunty! I love a good mystery! This sounds just right for a fast read…since you raced through it eagerly. This sounds like a series of really good train reads!